This Valentine’s Day, make sure your employees fall even more in love with their organization by ensuring you have effective Corporate Social Responsibility (CSR) initiatives in place. Corporate social responsibility refers to the social, economic and environmental impacts of an organization’s activities on a diverse group of stakeholders including employees, customers, the community and the environment. Having a CSR program can help your organization to motivate and engage your employees. Becoming socially aware and responsible also helps your organization become good corporate citizens, strengthen your brand, create a richer company culture, and generate a clearer sense of purpose for your team and your company as a whole. Here are ways in which Human Resources can lead the implementation and management of the CSR program for your company. To help employees become and remain engaged in their jobs, it is important that your organization is socially responsible through initiatives that make a positive impact on the community, resources and the environment. Now more than ever, employees are looking to work for organizations that are ethical and have values that align with their own. For your CSR program to work, it must make sense for your organization and employees. HR must ensure these initiatives align with your company’s values and not merely implemented for the purpose of improving your brand. Your CSR program should also be a part of your organization’s key objectives and should be agreed upon by everyone, especially the management and leadership team. Employees should feel empowered by your CSR initiatives and feel they are making a big contribution. It is important to involve your team in the process by allowing them to come up with ideas for your CSR program. Your organization’s CSR initiatives can also be included in the job descriptions of your employees. Finally, don’t forget to celebrate the successes. Your accomplishments can be shared through the company website, newsletter, social media and internal intranet. This will ensure you sustain the momentum for your CSR program and help give the program a sense of purpose. A successful CSR program requires your organization to help employees grow and become better people, as well as better professionals. It is important to ensure your employees are happy and satisfied with their jobs. For your team to be effective and engaged in their jobs, they need to grow as individuals. Professional growth is a key motivator for employees to remain with the company, as well as a way to attract new talent to your organization. – Provide healthy working conditions for your employees. – Recognize and reward employees for their performance. – Provide employees with cross-training and up-training opportunities. A CSR program is only effective if it is part of your organization’s corporate culture. Creating a workplace culture that is focused on change and responsibility starts with Human Resources. To cultivate a workplace environment that is socially responsible, HR can take the lead in implementing reward programs, charitable contributions and encouraging community involvement and practices. – Corporate sponsorship of community events. – Community programs and volunteer days for employees. – Recognizing employees who are socially responsible and rewarding them. – Matching employee charitable contributions. – Implementing environmentally sustainable practices in the workplace. Employees want to work for organizations that are seen as having a strong commitment to CSR. Embrace Corporate Social Responsibility this year and watch your employee engagement levels increase by leaps and bounds. 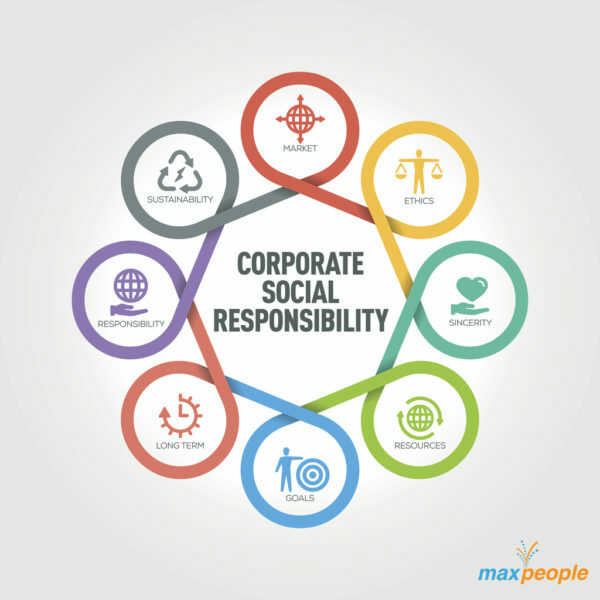 For help with your organizations Corporate Social Responsibility program, reach out to MaxPeople.